I was so enamored with the block print I created last week, that I wanted to work with the stamp again this week. I also have a (messy) habit of saving scraps of things that I think I can work into my fiber art. For example, interesting scrap papers, wrappers, plastics, bags, etc. My poor kitchen counter is on overload, so I decided to try to use some of my findings this week. I took a brown paper bag and stamped it using my block with three colors of paint. I thought it was quite lovely and took a lot of convincing myself that it was okay to cut it up, because I could always make something similar later! I also painted the backs of several corrugated coffee cup sleeves in the same paint colors. I gathered some tiny scraps from a quilted collage piece I just finished for Virginia Spiegel’s Collage Mania fundraiser (images to come really soon.) Lastly, I grabbed a beautiful World Market patterned brown paper bag and cut it into strips. Here’s the final composition! In the end, I didn’t make a very big dent in the stuff accumulated on my counter, but that’s par for the course! Here’s a fun one…Weekly Journal Quilt 4/52 2008! I carved a Speedycut block and printed the image onto some hand dyed fabric of mine. The thread is a very elegant tone on tone variegated Superior King Tut thread by Sue Nickels. I really enjoy the texture of the print and the undulations that occur in the quilting lines on the top half of the piece. I’m looking forward to trying it on a larger piece and accentuating those undulating quilting lines. They were an unexpected surprise! Now that I’m up to date with Weekly Journal Quilts, and my fabulous website and blog are up, I am totally looking forward to posting about lots of other things! Many thanks to Cyberstitches Design for my new digs! This is my first weekly quilt of 2008, aptly named 1/52 2008. I started using small journal quilts in 2007 to try new techniques, explore larger art quilt themes on a smaller scale, and have some fun with surface design. I think it was a valuable growth experience last year, so I have decided to continue in 2008. For more about weekly quilts, check out Jeanne Williamson, an amazing mixed media artist who has been doing this for years. The finished size is 6″ x 8″. I should complete the quilt by Sunday night at midnight. I shouldn’t worry about it being a masterpiece! This piece was created while I was using some eraser circle stamps I made to try to add depth to a red print I was using for my current large piece. The red fabric I was desperately trying to “fix” has since been edited out of that quilt for the greater good. I was also working with a piece of orange cloth and had this orange paint left over, which I hate to waste! 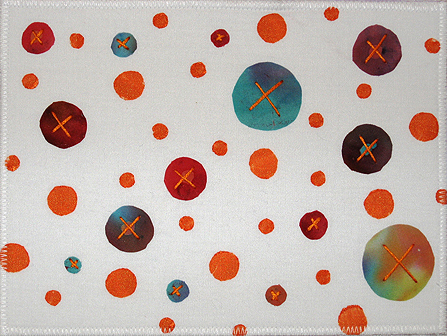 After the paint dried and was heat set, I added fused batik circles, hand embroidered the “x’s” and voila.